As we know Microsoft Outlook is one of the famous email client used all over the world. It’s simple interface, security and uninterrupted communication i.e sending and receiving emails qualities grows out its popularity among users. It stores information and manages data in a personal folder in the system called PST file. This file stores each item of Outlook like emails, contacts, tasks, notes etc. In spite of all these qualities, Outlook PST file is much prone to get corrupted and leads to occur different errors. One such error occurs due corrupted PST is ″Outlook file access is denied″ in MS Outlook. File access is denied. You do not have the permission required to access the file. Outlook access is denied also when Windows get upgraded to a higher version. This issue occurs when the PST file is in use and at the same time users switched by logging on to windows with a local account to Microsoft account. As mentioned earlier, the error is also caused due to Outlook PST file corruption. In this situation, the file can be highly damaged and cannot be fixing using Microsoft’s inbuilt utilities. Hence a professional tool will be very helpful to troubleshoot the ″Outlook file access is denied″ error. To do so one can use a PST Recovery Tool for fixing the issue with great efficiency and security. 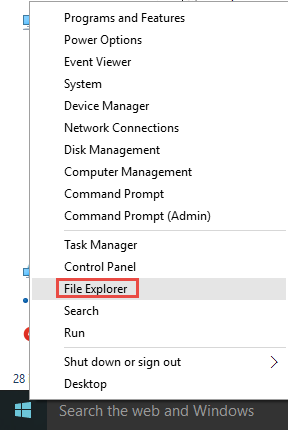 Right click on start button and select File Explorer from the given options. 3. Right-click on the selected PST file and go to Properties. In the Properties window, go to security tab and click on Edit button. 4. After that select your User Account and allow full control permission. 5. Save all the changes made and click OK until all windows dialog box gets closed. Now you have a full permission to access the MS Outlook PST file. But remember the above-explained method works only if you have a healthy PST file. 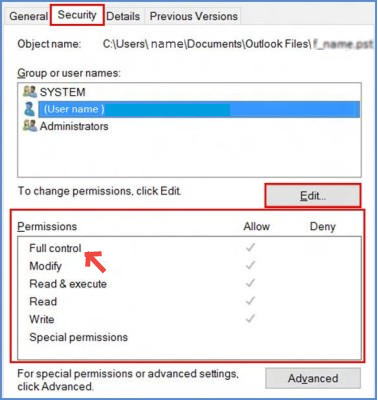 If you are still unable to access the file and Outlook file cannot be accessed showing the same access denied message that means the PST file is corrupted and needs to repair firstly. Microsoft has an inbuilt tool called Inbox Repair Tool or scanpst.exe which can be used to repair the file from minor corruption. But in case of major corruption, you will need a third-party tool as mentioned in the earlier section of the post.